Even though I'm half Irish-American, I've never really been that keen on St. Patrick's Day...but I'll take it as a good excuse to swatch some untried greens! The holiday always makes me think of my dad's mom and how she used to go on about being "100% Irish". She was the first child in her family to be born in America, but all of the family surnames are originally either English or Scottish. Nobody's really 100% anything. That side of my family had just been in Ireland long enough to forget they'd ever come from anywhere else...and I guess that's good enough! I perused my collection and pulled out a handfull of suitably festive greens to celebrate. All polishes in today's post were purchased by me or were gifts. SinfulShine In The Limelight is a kelly green cream. Another great SinfulShine shade! Overall, I've been really impressed with these. I bought In The Limelight on a total whim during the recent-ish 99c sale at Walgreens. This is two coats and the formula's just what I like from a cream. It's thick-ish and goes on smoothly. The color's also surprisingly flattering. I swatched it at ceclarlinetlo's suggestion on MUA's Nail Board. I've seen a lot of negative reviews of Lime Lights because it's just shimmer...but that's exactly why I bought it. It's ideal as a topper. This is one easy coat over SinfulShine In The Limelight and it's rare that two shades with such similar names work this perfectly together. I think Lime Lights is discontinued and I'm pretty sure I bought it on Amazon. 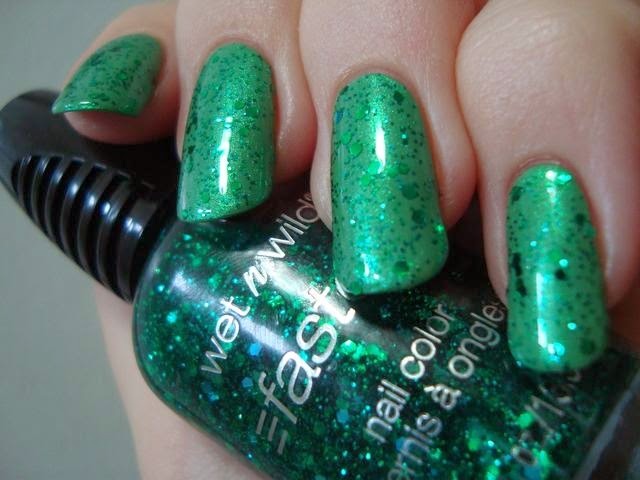 Wet n Wild Emerald The Crown Jewel has a mix of green and light blue microglitter, two sizes of green hexagonal glitter, and medium light blue holographic hex glitter in a clear base. I've been trying off and on for ages to figure out a base for this glitter...and I'm not completely sure I picked the right one. The glitter was more visible in person than in my photos. It came out last spring as part of the Hot Rocks and Zeus has actually had a bottle much longer than I have. I bought it at CVS during one of those sale whims I sometimes get. It's interesting and applies pretty evenly, but something about it just doesn't strike me. 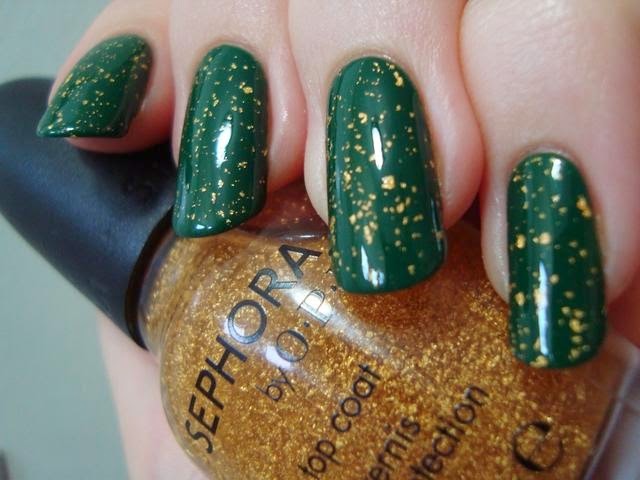 Zoya Yara has a mossy green cream base with gold microfleck shimmer. I got Yara as a gift from a Nailboarder last year and I adore it. It's gorgeous and the formula is up there with Zoya's best. This is two coats. I wore it with a cannabis leaf stamped on it as a tribute to my HG hand cream, The Body Shop Hemp Hand Protector. China Glaze Holly-Day is a dark green cream. I'm mad at myself over this one. I derped and didn't notice the ebay listing was for a 0.325oz bottle and not a 0.5oz one. This is the same size as the dinky Travel In Color and Matte Magic bottles. I think it might also be dupe-ish for Sinful Colors Last Chance. It does that same thing where it photographs lighter than it actually is in person. It looks nice enough here, but it's gorgeous in person! This is three coats because it's on the thin, watery side. Sephora by OPI It's Real has small 18k gold leaf pieces in a clear base. Something I never thought I'd own, but I couldn't resist a bottle when I found it at Big Lots for $1.80! I like it much more than I thought I would. The formula and application are surprisingly smooth, and the cleanup is effortless. The bits are smaller than most other gold leaf toppers, but I think it's better that way. 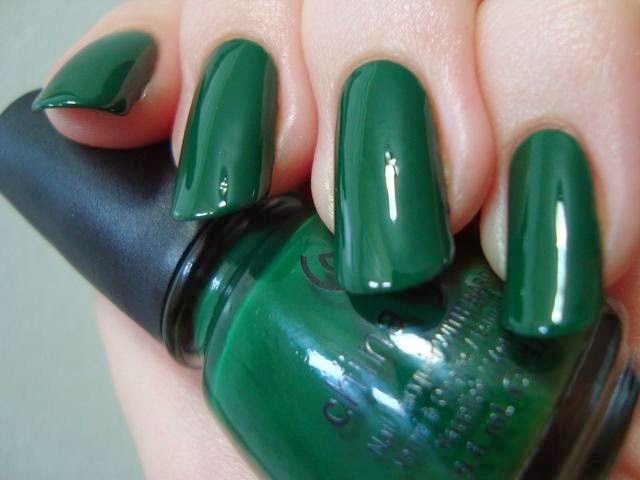 Green's such a polarizing color for polish. Do you wear it or do you find it unnatural? I love green and teal color nail polish! I used Sephora by OPI Leaf Him at the Alter. Great color!